Willow Burl Cabins is situated on 48 acres of treed land at the foot of Canoe Mountain in the Robson valley. 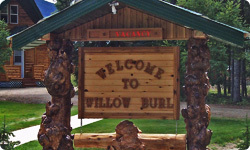 Willow Burl is 8 kilometers south of Valemount B.C., which is 20 minutes to Mount Robson provincial park and approximately a one hour drive to Jasper National park. Valemount is nestled on the valley floor at the junction of 3 separate mountain ranges. The area offers many of the activities associated with a holiday in the mountains. Your hosts, Al and Susie Forsyth offer the finest of cabin accommodations. Being family built, owned and operated, Willow Burl offers a standard of service above and beyond the competition. Whether traveling just overnight or enjoying the valley for an extended holiday, Willow Burl Cabins will supply the same great service time and time again.